*Actual On Road Price of KTM RC 390 at the dealership may vary. KTM RC 390 that gets all the goodies like - ride-by-wire tech, slipper clutch and a larger 320 mm front disc brake for improved stopping power. The bike also gets ECU-based acceleration, which has improved the throttle response as well. In fact the new RC 390 gets a side-mounted exhaust unlike the underbelly exhaust of the previous model. According to KTM officials the new aluminium exhaust muffler has been added to meet the stringent Euro 4 emission norms in 2016 and the same has been brought to India in 2017. 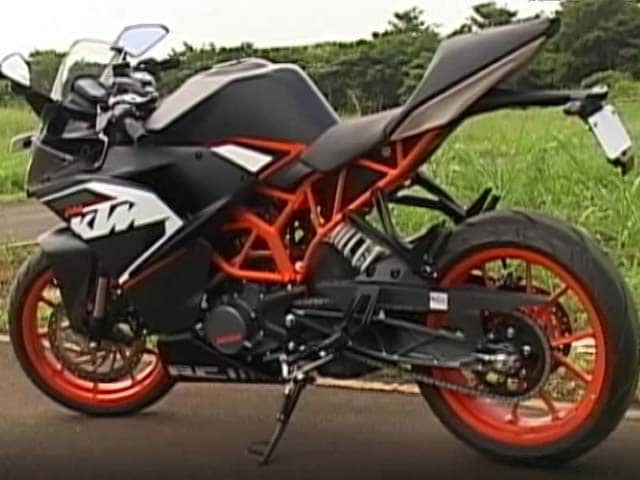 KTM RC 390 Launched at Rs 2.25 lakh (ex-showroom, Delhi). KTM RC 390 is a fully faired sports bike based on the Duke 390 naked motorcycle. The flagship model features slightly modified chassis resulting in improved ride quality. The RC 390 is built around a steel trellis frame, similar to the one in the Duke version and the front wheels get 43mm inverted forks while the rear gets a monoshock that is directly linked to the alloy swingarm. Powering RC 390 is a single-cylinder 373.2cc engine which manages to churn out 44PS and 35Nm of torque. On the safety front, the company offers ABS as part of standard equipment. Besides, the bike also gets slipper clutch, new exhaust that abides by Euro IV emission norms, automatic head lamp, new MRF tyres, new rear view mirrors, adjustable clutch and brake levers etc among various others. Built around the steel trellis frame, RC 390 is a fully faired version of its naked sibling, Duke 390. Alterations are made to the chassis offering improve ride quality. The bike without a doubt is one of the best looking options in its segment featuring an orange coloured frame that reinforces its sporty character. In front, it gets twin projector headlamps, daytime running lights and a windshield. The angular shaped ORVMs come with integrated turn indicators and there is no seat for pillion, but KTM has further cushioned the rider seat. Power is drawn from a 373.2cc, single cylinder, liquid cooled engine good for maximum power of 42bhp at 9000rpmm and top torque of 35Nm at 7000rpm. The engine comes mated to a six-speed transmission. The fully faired middle weight sports bike gets a host of features including a fuel injected engine, new paint scheme, full fairing, orange painted frame, cushioned seat, engine cowl, LED tail lamp, projector headlamp, telescopic front forks, monoshock rear absorbers, large fuel tank, digital speedometer and tachometer, digital trip meter, ABS etc. Stopping power is derived from 300mm and 230mm disc units placed in front and rear respectively. Anti-Lock-Braking system adds further dint to the braking force. Tyres measuring 110/70 and 150/60 are fixed in front and rear axle respectively. Both the tyres get 17 inch alloy rims. The model fields against rivals such as Honda CBR 250R, Mahindra Mojo, DSK Benelli TNT 25 and DSK Benelli TNT 300.